Carrying on with my photos from Sunday School 2013, here are some of our little group. 8 cars is a pretty small subset of the roughly 350 present but given the (great) location I believe it was just the right number as we took up the entire aisle. I saw plenty of people checking out the cars throughout the day and I’m happy with the variety we had. Ideally I would have selected a Mustang that was an actual colour but grey was all that was available. I wanted to make the group as colourful as possible since there would already be yellow, red, and green with the Foci and Kyle’s cars. 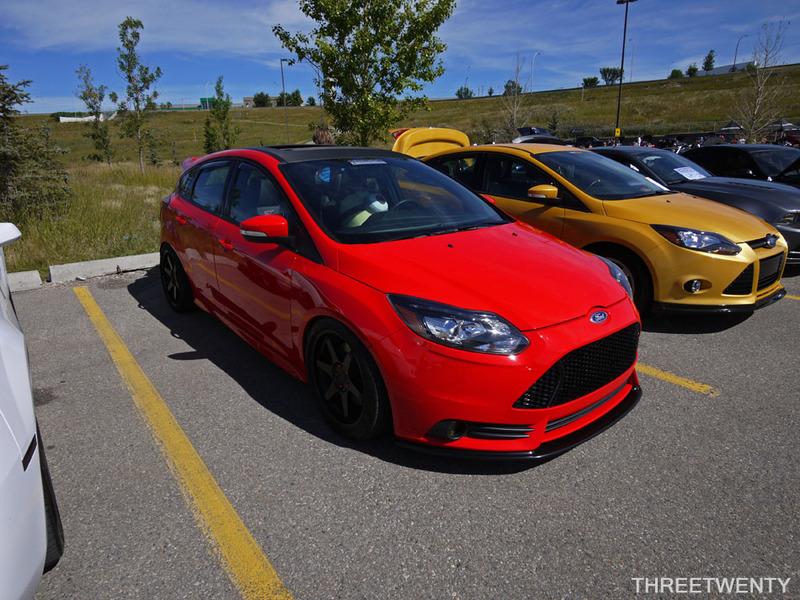 Incidentally, the Focus that was going to come for Metro (prior to picking the Mustang) was blue. 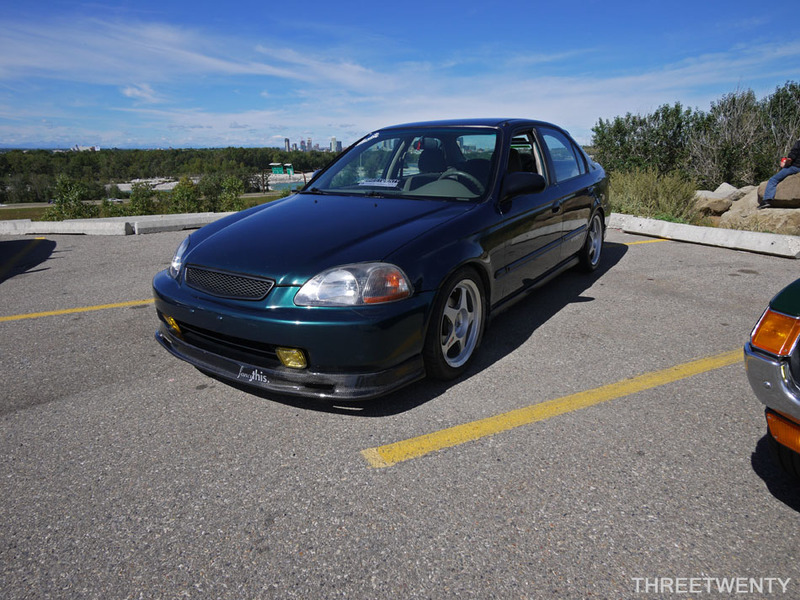 First up, parked in the corner, was Kyle’s Civic sedan. It looks awesome on the new Regamasters. 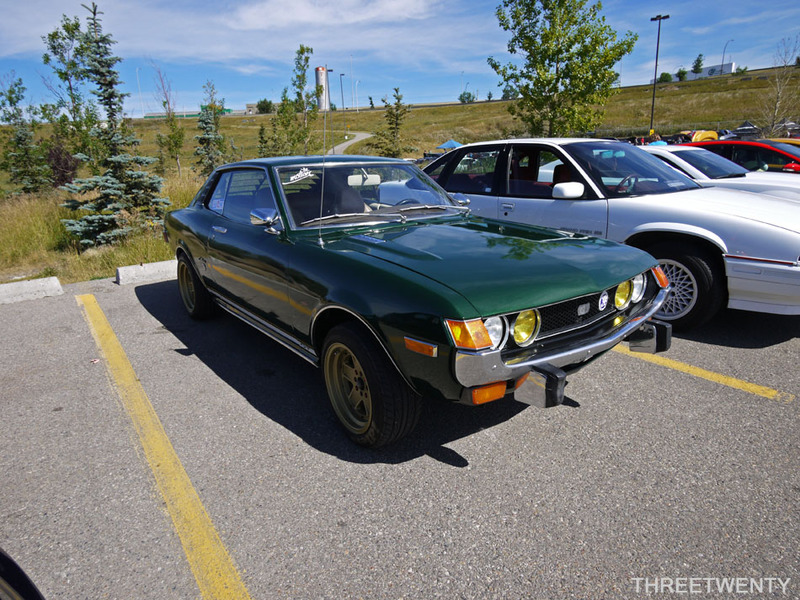 Next to that was his ’74 Celica. 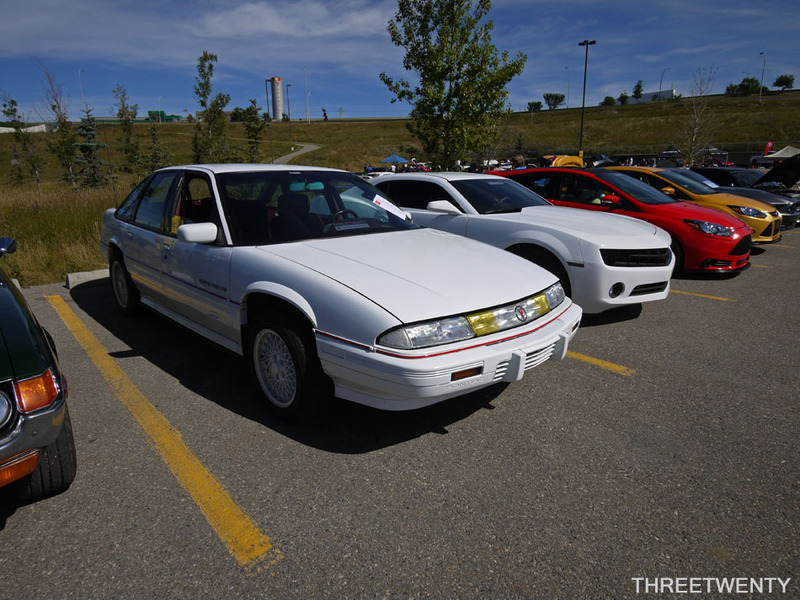 Thanks to Brenda driving it down, we had my Grand Prix making a rare public appearance. It seems to spend most of its time in storage or under a car cover at home. It got plenty of attention at Sunday School though so methinks I should take it out more. Derrick’s Camaro was next to the GP just as it was last year. 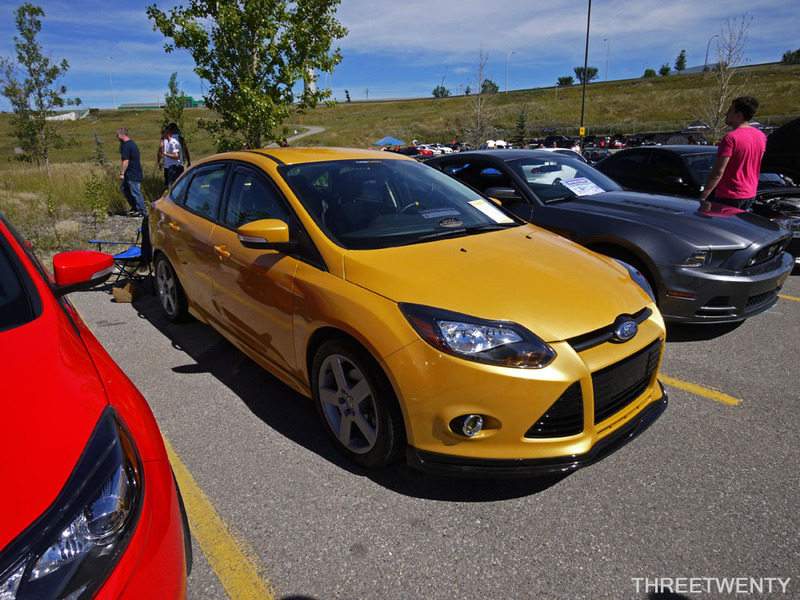 No longer the odd ones out at local meets and shows, but rather a part of a growing number of domestics. …and my STedan. After the spring install two days before I was driving and driving trying to get the springs to settle as much as I could. Haha. Metro’s 5.0 was looking its best and sporting a few magnets for advertising. Finally, as a last-minute addition was Solomon’s E90. The VMRs are back to silver now. 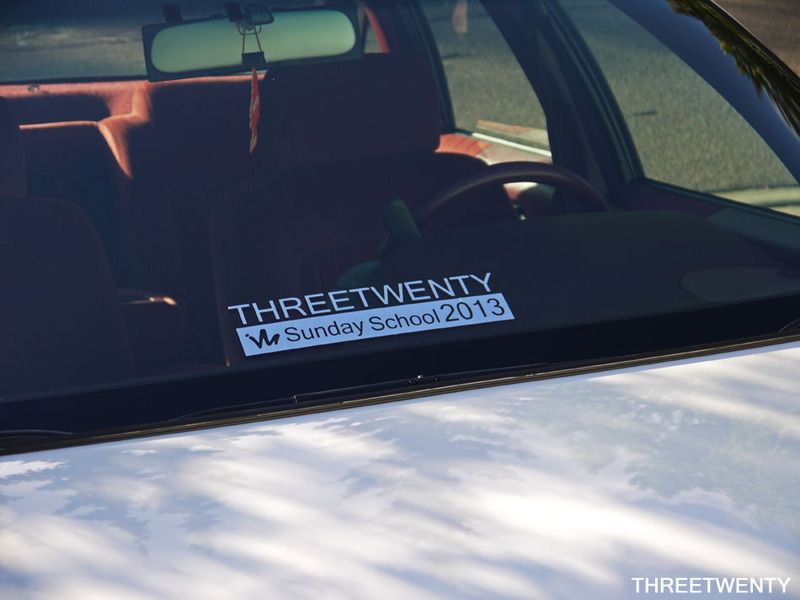 You may have noticed that most of the cars in our group had identical decals on the windshield (save for the Mustang, and the E90 since I didn’t know Solomon was attending). I really liked having the commemorative decals for the UCCarClub’s group at Driven, so with Terence’s help I designed and had some made for this show as well. Since the cars were a variety of colours I wanted something neutral that would work on all of them, but at the same time I wanted something unique. I opted for this ‘brushed metal’ vinyl and I’m really happy with how they turned out.